Is The Florida Bar Selling Law License to Wealthy Under-Educated White Men? Tallahassee, FL (Leon County)—During the coverage of the 2016 Presidential Primaries in Florida, many news journalist noted the big difference in demographics of those citizens living in northeast and northwest Florida (Florida’s panhandle) versus those living in central and south Florida. In central and south Florida, communities are made up of a more diverse group of people to include Hispanics, Middle Easterners, Asians, Haitians, Jamaicans, Bahamians, etc. In central and south Florida, leadership roles in government within those communities are very diverse. In northeast to northwest Florida, many communities are vastly made up of white and black Americans. As central and south Florida continues to grow, more and more people are moving to northeast and northwest Florida. But, while some people may see the movement to diversify northern Florida as a good sign, others, particularly some white people in northeast and northwest Florida, view the diversity movement as a threat to their jobs—therefore, black people are being killed and/or imprisoned without due process or lack thereof to ensure that white leadership remains generational. Tallahassee—Florida’s capital city, is where most, if not all of the state agencies are headquartered, along with the headquarters of many other organizations such as The Florida Bar and the Judicial Qualifications Commission. The Florida Department of Law Enforcement and the Florida Supreme Court are located just blocks away from the Leon County Courthouse in the heart of downtown Tallahassee. The city of Tallahassee is a small city in comparison to Orlando. Tallahassee is surrounded by at least five mid-sized rural counties where hundreds of Hispanic and Haitian migrant workers come and go for seasonal work. As more and more children of migrant workers are becoming educated; as more and more American citizens from Puerto Rico are moving to Florida, groups of white people, particularly those working within the judicial system, are feeling more and more pressured to hold their positions by any means necessary. The Florida Bar has repeatedly disciplined many lawyers knowing that many lawyers fear going into some judges courtrooms due to retaliation for competently representing their clients. Many African-American lawyers have also been ignored by judges and unfairly disciplined. Meanwhile, complaints filed with The Florida Bar against some white lawyers have been either ignored or left stagnate. John Emmett ‘Jack’ Campbell graduated from Leon High School in Tallahassee in 1991. Jack Campbell is the son of former longtime serving Leon County Sheriff Larry Campbell. Both Larry Campbell and Jack Campbell have deep roots in Tallahassee and Jacksonville. Before his death, Larry Campbell had nearly 50 or more years of local law enforcement service within the Tallahassee area having worked for different law enforcement agencies. While Jack Campbell has spent the past 15 years as an assistant state attorney working directly under Florida’s Second Judicial Circuit State Attorney Willie Meggs, Willie Meggs’ son and daughter worked as Leon County Sheriff’s deputies directly under Leon County Sheriff Larry Campbell. For many years citizens of Tallahassee have feared speaking out against numerous acts of injustice imposed by the Meggs/Campbell Klan. In 2015, after Florida’s Second Judicial Circuit State Attorney Willie Meggs announced that he would not run for re-election—bringing an end to his 30 years or more as Second Judicial Circuit State Attorney. Assistant State Attorney Jack Campbell quickly told several media sources that he (Jack Campbell) planned to seek Meggs’ position. Currently, Jack Campbell is running to be elected as Florida’s Second Judicial Circuit State Attorney. In spite of Jack Campbell having worked extremely close to State Attorney Willie Meggs for nearly fifteen years, many question whether or not if Jack Campbell’s law license is legitimate. There is absolutely nothing on Jack Campbell’s profile showing where he attended Florida State University College of Law. In fact, The Florida Bar’s online profile of John Emmett ‘Jack’ Campbell does not state Jack Campbell as having attended Florida State University College of Law. Many people in the community really question Jack Campbell’s extent of knowledge of the law. For the majority of Assistant State Attorney Jack Campbell’s law career, State Attorney Willie Meggs assigned Jack Campbell numerous criminal cases that were being investigated by his (Jack Campbell’s) father at the Leon County Sheriff Office. Many complaints were filed with the Leon County Sheriff’s Office in regards to perjured trial testimony by Leon County Sheriff’s deputies who testified for Jack Campbell; Leon County Sheriff’s deputies smuggling contraband into the Leon County jail to set up defendants who were being prosecuted by Jack Campbell; financial compensation or special provisions to jailhouse snitches; Sheriff Larry Campbell’s use of unauthorized people to make arrests; public records violations and a slew of other unlawful and unethical acts. In the cold-blooded murder case, State of Florida vs. Conor McBride, Jack Campbell and his dad (Leon County Sheriff Larry Campbell) made special provisions for the parents of 19-year-old, Mr. McBride, a white male inmate at the Leon County Jail, to be escorted to a private room in the jailhouse where Conor McBride’s handcuffs were removed and other security measures were violated in order for Mr. McBride to hug and kiss his parents—a personal contact visit and meeting. Months before the meeting, Conor McBride confessed to having a history of arguing with his girlfriend. During their last argument Mr. McBride retrieved his father’s shotgun—and at pointblank range—he blew her brains out of her head—a cold-blooded act of domestic violence. The victim, 18-year-old Ann Grosmaire was brain dead—with only the brainstem left in her head. Ms. Grosmaire was on life support for several days. Her parents had to make many heartbreaking decisions. 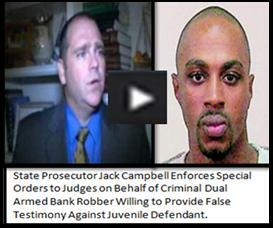 According to reports, Jack Campbell spoke of sentencing Mr. McBride to 5 years in prison. State Attorney Willie Meggs allowed Restorative Justice to play a role in Mr. McBride’s prosecution. Restorative Justice is used in schools K-12 as a means to punish kids who commit minor offenses such as vandalism of school property. For State Attorney Willie Meggs, Assistant State Attorney Jack Campbell and Sheriff Larry Campbell to provide any special provisions to Mr. McBride, let alone allow “Restorative Justice” to play a role in the cold-blooded murder of Ms. Ann Grosmaire after she had suffered regular occasions of domestic violence by her murderer is disgraceful! Ms. Ann Grosmaire was not a piece of property. She was a beautiful human being. Why does there seem to be confusion about where Jack Campbell attended law school? What law school teaches its students to seek Restorative Justice for the act of cold-blooded murder in domestic violence cases? Or is their simply a backdoor fee at The Florida Bar for wealthy rich men to get their law license without the proper education? Author MAUL10Posted on August 22, 2016 November 1, 2016 Leave a comment on Is The Florida Bar Selling Law License to Wealthy Under-Educated White Men? Tallahassee, FL—Florida State University, FAMU, and Tallahassee Community College students and parents MUST KNOW THAT EVIL SUPPORTS EVIL!!!!! We often look for a reason WHY judicial officials collaborate to send INNOCENT children and INNOCENT adults to prison—‘Florida’s Death Camps’ and/or to Florida’s Death Row–Could it be POWER MOVES? Could it be ARROGANCE? MONEY?—Really, the only explanation for judicial officials to knowingly leave criminals such as cold-blooded murders out in communities, while sentencing INNOCENT people to prisons—is due to the EVIL that lives inside of them. EVIL people such as: former Leon County Sheriff Larry Campbell and his son Assistant State Attorney Jack Campbell, along with District Two Medical Examiner Associate Dr. Anthony Clark, State Attorney Willie Meggs, Assistant State Attorney Eric Trombley, Chief Assistant State Attorney Georgia Cappleman, Judge Robert Wheeler, Circuit Judge James C. Hankinson (also a former U.S. Assistant Attorney), Lead Public Defender Nancy Daniels, Circuit Judge Jackie Fulford, Assistant Regional Counsel Daren Shippy, Criminal Defense Attorney Greg Cummings, and many others. I really enjoyed watching you on Morning Joe last Wednesday, July 27, 2016. It really doesn’t matter what talk show that you appear on, you always seem to say something to put a smile on my face. Whether it is your sarcasm or you say a joke, I know that when I watch you on T.V. you’re going to say something to make me smile, thank you. I’d also like to thank you for all that you have done for all Americans and those in other countries. You have definitely made a difference in a lot of lives. You will be missed very much. With all due respect, sir, you are wrong. There are a lot of qualities about you that make you special to the African-American community. I know this because I’m a 43-year-old, African-American single mother of four (two biological sons & two adoptees). I first come to learn about you during the late eighties when I was a high school student. My mama watched CNN’s coverage of politics on the T.V. in livingroom like there were no other channels to watch (we had other cable channels). The thing was we only had one T.V. in the house (need I say more). I have always found you to be a compassionate man. And believe it or not—that’s what a lot of people within the African-American community appreciate the most about white people—is when they have compassion. People don’t have to be friends to show one another compassion. There are a lot of testimonies about people showing compassion for strangers. You didn’t have to become the Vice President of the United States, but you did. And I’m sure, that right when you probably thought that you’d seen it, you saw more than you’d bargained for—the continued existence of ugly racism and the disrespect from state leaders against President Barack Obama. Some African-American citizens highly respect you because just as we knew what could come of an African-American man becoming the President of the United States of America, we also knew what could come of a white man fully supporting an African-American man. So you were/are in our prayers as well. And we thank you very much for supporting President Obama. There are a lot of African-Americans who do trust law enforcement officers; there are a lot of African-Americans who want to trust law enforcement officers; and there are a lot African-Americans who don’t trust law enforcement officers. The same as African-Americans are not oblivious to criminals within their neighborhoods, police chiefs, supervisors of police officers, elected deputy sheriffs, deputy sheriffs’ command staff and supervisors of deputies and law enforcement officers are not oblivious to bad cops—racist cops. If parents drill in their kids mind that being a law enforcement officer is the “most dangerous job in America,” then how do parents explain to their kids the statistics that show civilians are more than likely to be shot/ shot and killed by white male cops than cops of another ethnic group? From kids’ point of view, kids will think that white cops are either more fearful or less prepared to interact with civilians than cops of another ethnic group. I can personally tell you where some are—in Tallahassee, Florida—for sure within the Leon County Sheriff’s Office. You see, I believe in my heart that all cops are not bad. But since my son, DeShon Thomas was kidnapped at age 17-years-old in Tallahassee by a white man who’d been given a badge, a patrol car and the authority to impersonate a law enforcement detective—I am now very cautious when it comes to interacting with law enforcement officers. Anyway, a couple of years prior to my son’s kidnapping, I was discussing a non-emergency issue with a white male Leon County Sheriff’s Deputy, who looked to be aged fifty or older. Within minutes of our discussing the issue, the deputy noticed a few ‘Obama Biden’ campaign yard signs and buttons that were in my possession. The deputy changed the top to the upcoming presidential election. The deputy did not make any disparaging comments about Barack Obama as I’d kind of expected him too (so many other white men had on my job and on T.V.). However, the deputy didn’t show support for Mr. Obama (which was cool with me because I was trying to handle the issue for at hand). Instead, of re-focusing on the issue at hand, the deputy began making disparaging comments about you, Mr. Biden. Among other things, the deputy said, “Those of us at the Leon County Sheriff’s Office do not blame Obama for running for office. We blame Biden because he (Biden) should know better.” The deputy’s tone and body language showed that he was very angry about your support for Mr. Obama. And honestly, I was shocked because I know your history and how you’ve always supported and praised law enforcement officers and first responders all across the country. There were other disturbing things that the deputy said that closely came to calling you an ‘N-Lover.’ I was extremely disgusted! Here was a white man, nonetheless, that was in a full Leon County Sheriff’s Deputy uniform, someone who had sworn an oath to protect and serve my neighborhood, who was patrolling my neighborhood (majority African-Americans), and this deputy was having this near ‘meltdown’ and showing his angry about a white man supporting a black man to me. Believe me when I tell you that this deputy was so angry that I didn’t say anything. I think that I just froze because I was scared. It was a weird experience because the deputy did not know anything about me—other than the fact that I was a mother. The deputy didn’t know that I was a volunteer for the Leon County Democratic Party—a proud voter who loved to exercise my right to vote. The deputy didn’t know that no matter how excited African-Americans, including myself, were to have an African-American man in place to run for the highest office in the country—the President of the United States of America—yet that did not mean that all African-Americans were automatically going to vote for Mr. Obama. (In the primaries I’d cast my vote for Hillary Clinton because in comparison to both you and Mr. Obama, I truly believed that Hillary was more experienced—‘Powerful Woman!’) And another thing that the deputy didn’t know was how excited that I was that you were on the Democratic ticket to become Vice President of the United States of America. At the time of the incident with the deputy, I’d only been living in Tallahassee for about seven years. Every election cycle, Leon County Sheriff Larry Campbell and State Attorney Willie Meggs (both white men, both incumbents) had run as Democrats. Each election, both incumbents were re-elected to office, most of the time without opponents. Although the deputy stated, “Those of us at the Leon County Sheriff’s Office…,” I’d really hoped that Leon County Sheriff Larry Campbell had not been defiling the Democratic ticket by being an undercover racist and angry man. I wanted to contact Sheriff Campbell to find out his position on race related issues, but my spirit would not allow me too. The same as people say in regards to children/parents, “The apple doesn’t fall too far from the tree,” the boldness and the openness of that deputy’s ability to speak disparagingly about you, Mr. Biden, actually showed that speaking about you in such a disgraceful manner must have been an open way of speaking within the Leon County Sheriff’s Office. After my son’s kidnapping in January 2011, as I became very vocal about the injustice in Tallahassee, more and more people started speaking out about Sheriff Larry Campbell’s immoral and unethical character. Here are just a few links regarding Sheriff Campbell’s character. In January 2015, Governor Rick Scott appointed Mike Wood, a white man who has been with the Leon County Sheriff’s Office for over 30 years as interim sheriff. Mike Wood was who Larry Campbell wanted to succeed him. Mike Wood has a criminal drug record. It is job promotions; recognition and honors of evil people like Larry Campbell, coupled with the Campbell/Meggs klan and fake cops in using the judicial system to hunt down and kidnap black boys and men, along with Governor Rick Scott’s contract to guarantee private prisons 90% occupancy rate, as reported by the Miami Herald, as to why African-Americans and law enforcement officers in Tallahassee are so widely divided. These types of things will never be beneficial to President Obama’s ‘My Brother’s Keeper’ neither will they help bridge the gap between African-American communities and law enforcement officials. When I lived in Tallahassee, I voted twice for Leon County Sheriff Larry Campbell and State Attorney Willie Meggs because I believed that their values as Democrats were the same as mine—specifically to keep my family and others safe and to exercise state and federal laws ethically, morally and professionally. Never in a million years would I have thought that leaders whom I helped vote into office would conspire to kidnap my 17-year-old son. Never in a million years would I have thought that State Attorney Willie Meggs would assign his assistant state attorney Jack Campbell (the son of Sheriff Larry Campbell) to prosecute criminal cases that his dad and his dad’s employees (other deputies) were investigating. Not only is my son innocent—it’s extremely pathetic to know that in today’s time that this is still occurring—and these sick people are using the judicial system to push their evil agendas for profit. I was being robbed of nearly $30,000, while Governor Rick Scott, Attorney General Pam Bondi, The Florida Bar and the Judicial Qualification Commission bent over with their heads in the sand. My son has been separated from me and the rest of my family for five years now—and attorneys are afraid to go before certain judges in Tallahassee. Lastly, Mr. Biden, thank you for sharing your family with all of us. During your appearance on Morning Joe, you quoted your dad as to having said, “I don’t expect the government to solve my problem, just understand my problem.” I believe that quote to be very powerful! And I believe millions of Americans feel the same as I do. People don’t want the government to solve their problem—to just understand their problem. There are laws, starting with the United States Constitution, that are in place to protect all Americans. If elected officials and those whose careers demand that they exercise state and federal laws accordingly—and they do their jobs accordingly—then there would be fewer problems. Unfortunately, in a lot of African-American communities across the United States, some officials within local governments have chosen to ignore laws, and are a huge part of the problems that exist. We all know that a problem cannot solve itself? The majority, if not all, African-American citizens do not “blame” you for Mr. Obama being elected as the President of the United States of America. We thank you and your wife, Jill, for supporting President Barack Obama and First Lady Michelle Obama. Open Letter to Florida’s Appropriations and Subcommittee on Criminal and Civil Justice: Who’s Governing Tallahassee’s Judicial System and Florida’s Jails and Prisons? Mothers Against Unethical Laws (MAUL) Blog at WordPress.com.